Temps are warming up now in the UK, and the brood fish tanks are between 12 and 14 degrees. Early signs are that the fish have over wintered really well with no signs of trouble yet. The two brood fish tanks remained unheated through the winter and the temperature didnt drop below around 7 degrees, which is much warmer than my fish usually enjoy over the winter. The previous year, they spend most of the winter at around 2 degrees, and had to put up with 2 pond moves aswell. I think thinning out my collection last autumn has also helped, taking the load off the filters. And the other change to my normal winter routine has been to feed them once a week - just a small handful mind, and only on the warmer days. Not sure whether this had any effect, but I mention it as part of recording my approach for the winter. The other thing to mention is both tanks went through a full parasite removal set of treatments in late autumn - which I achieved with salt up to 0.87% for a week and a fluke treatment; you might remember this from my earlier posts, but I mention is once again because I suspect this is what's helped the fish the most over the winter, along with continuing water changes at a few % per day and ofcourse the drums are taking the waste out every 20 mins or so. The new brood fish have settled in very well; we quarantined them ourselves with the full set of parasite treatments (as above), and 3 lots of heat ramping. Here's a pic of the main female - a 3 year old showa from shintaro. I've not measured her but she must be in the mid sixties (cms). I've added a short video of her in the QT with the other fish my wife picked up on the same trip. 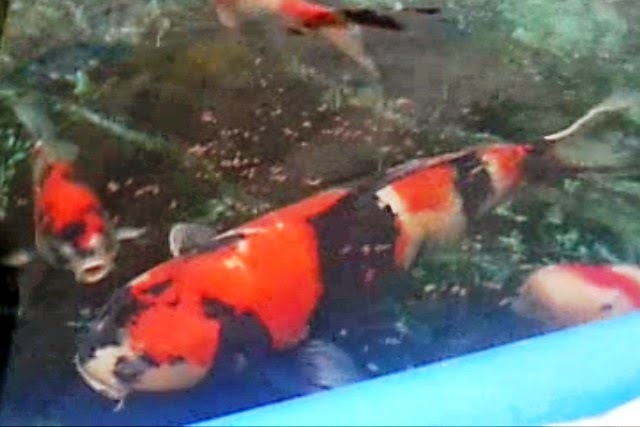 The two kohaku's and shiro are nissai, as are the showa males. I'm not intending to breed from the kohaku's and shiro - but you never know. They are a bit of fun, and this is the first time we imported fish back from Japan so it's also been about testing out how that works. I also still have one male kohaku's at Yume Koi which I need to collect. I have to confess - apart from quarantining the new arrivals, and looking after my existing fish, I've done almost nothing on the project over the winter. So, I'm a bit behind now but last weekend I started draining down the fry ponds and we've picked up new liners which I'll get into place over the next week or two and start them filling. I'm aiming at breeding my first set mid May - maybe a little earlier, perhaps a little later. Last year, the whole project was a rush - like a 100m sprint that went on for 6 months. This year, I'm better prepared and I will take advantage of that. I'm only going to spawn once the fry ponds have matured. I am still planning on leading with my new showa set, probably with kohaku taking the other fry pond in parallel. If I feel my takeda showa has egged up in time, I may spawn both showa's in parallel and save the kohaku's for later in the year. And finally. I opened last month's Koi Carp magazine and read through their annual awards - for those that don't read the mag, these are a set of annual awards voted for by the public. They range from best filtration unit, through to best dealer and a bunch of other stuff. One of the awards is best koi club, which my koi club came runner up in. I'm the chairman of my club, and this was a big surprise to the members but we're all very happy with the news and it gives us confidence that we're developing the club along the right lines. I was even more surprised when I saw my name in the list of "Best Koi Keepers", down in 5th place noted as "highly commended". Unbelievable! I am so chuffed - 5th out of 60m British people isnt bad. Ok, so koi keeping my be a small pond in the grand scheme of things, but to be noticed in that way has given me a big boost. Thank you to everyone that voted. My two article series has now been published in koi carp, and I concluded the series by outlining my revised my project aims and plans - I'll talk more about that in my posts over the next few weeks. but rest assured, I'm still committed to the project and aim to win prizes at koi shows with koi I've bred myself.